Asthma was originally described as an inflammatory disease that predominantly involves the central airways. Pathological and physiological evidence reported during the past few years suggests that the inflammatory process extends beyond the central airways to the peripheral airways and the lung parenchyma. The small airways are capable of producing T-helper-2 cytokines, as well as chemokines, and they have recently been recognized as a predominant site of airflow obstruction in asthmatic persons. The inflammation at this distal site has been described as more severe than large airway inflammation. These findings are of great clinical significance, and highlight the need to consider the peripheral airways as a target in any therapeutic strategy for treatment of asthma. Asthma is a complex, chronic inflammatory lung disease that is characterized by epithelial shedding, airway smooth muscle hypertrophy and hyperplasia, overproduction of mucus, and airway inflammation. The pathophysiology of asthma has traditionally been attributed to an inflammatory process that occurs predominantly in the large airways . Early studies, conducted over 100 years ago, used autopsy specimens to study the macroscopic morphological and histological changes that occur within the large asthmatic airways . Those studies clearly showed that asthma involves structural airway changes, including increased size and amount of airway smooth muscle, thickened basement membrane, mucus hypersecretion and oedema in the airway wall. The application of fibreoptic bronchoscopy in asthma has enabled us to obtain small human endobronchial biopsies from the large airways. This, together with the development of molecular biology technologies (i.e. immunocytochemistry and in situ hybridization), has advanced our understanding of the pathogenesis of bronchial asthma [2,3]. Studies using surgically resected lung tissue [4,5,6], autopsy lung specimens [7,8,9] and transbronchial biopsies [10,11] indicated that similar but more severe inflammatory and structural changes also occur in the small airways [8,12,13] and in lung parenchyma  of asthmatic persons. These findings may be extremely important, because the total volume and the combined surface area of the small airways are much greater than the surface area of the large airways . Currently, the therapeutic challenge is to develop better inhalation technologies in order to improve delivery of anti-inflammatory agents to the lung periphery. The present review evaluates the physiological and the pathological evidence presented to date that outlines the contribution of the small airways to the pathophysiology of asthma. Most of our knowledge of lung function in asthmatic persons comes from spirometric and plethysmographic measurements made during bronchoprovocation, and these are dominated by large airway responsiveness. Because the volume and surface area of the lungs increases with increasing airway generations, the contribution of peripheral resistance to the total lung resistance was originally believed to be minimal . Research conducted over three decades ago, using a retrograde catheter technique in animal models [15,16], demonstrated that the small airways are pathways of small resistance, contributing less than 10% of the total resistance to airflow in the lung. Hence, Mead et al. originally described the small airways as the 'quiet zone' of the lungs in 1970. Since then, more sophisticated frequency-dependent measurements of small airways function have been developed. Invasive studies in mongrel dogs using alveolar capsules [18,19,20] or the forced oscillation technique [21,22] have demonstrated that both airway and parenchymal compartments contribute to airway hyper-responsiveness.Methacholine-induced increase in parenchymal resistance has also been reported in New Zealand white rabbits [23,24], guinea pigs  and rats [19,26,27]. Invasive studies were carried out by Ohrui et al. in patients with asymptomatic asthma using a catheter-tipped micromanometer wedged into the lower lobe of the bronchus in order to partition central and peripheral airway resistance. Those investigators constructed separate dose/response curves in vivo, and showed a dose-dependent increase in both central and peripheral airway resistance in response to inhaled methacholine in all persons studied. They proposed that inflammation-induced structural changes in the small airways might be responsible. Van Brabandt et al. showed that the peripheral resistance contributes between 50 and 90% of the total resistance in normal lungs, as well as in the lungs of patients with chronic obstructive lung disease. Those investigators concluded that the contribution of the small airways to the total lung resistance has thus far been grossly underestimated, and that the physiological outcome is largely dependent on the frequency used to measure peripheral lung mechanics. This is because at high-frequency, low-amplitude oscillations the contribution of the small airways to the total lung resistance is minimized, whereas at low-frequency, high-amplitude oscillations their contribution is maximized. More recently peripheral airways, including lung tissue, have been recognized as a predominant site of airflow obstruction in asthmatic persons [30,31,32]. Wagner et al. showed that, in mild asthmatic persons with normal spirometry, peripheral airway resistance was increased up to sevenfold when compared with control individuals, and these measurements correlated with responsiveness to methacholine. In addition, computational analyses based on quantitative histology [34,35] have shown the peripheral airways to account for the majority of airway hyper-responsiveness among asthmatic persons [34,35]. Noninvasive methodologies for separating airway and parenchymal mechanics have been developed using the low-frequency forced oscillation technique in animals  and in humans [37,38]. With this technique, Hall et al. demonstrated that inhaled methacholine alters both airway and parenchymal mechanics in infants, and that infants with a history of wheeze have significantly increased parenchymal responses to methacholine when compared with control children. These studies further consolidate the contribution of the small airways to the total lung resistance. Bronchoscopic studies have shown that bronchial asthma is characterized by infiltration of central airways with inflammatory cells and an upregulation of T-helper-2-type cytokines. A large proportion of information on the role of peripheral airways in the pathophysiology of asthma came from autopsy studies [7,8,40], because bronchoscopic sampling was largely limited to proximal airway sites only. Those studies showed that the entire length of the airway is involved in asthma [35,41,42,43]. Carroll et al. examined the distribution of inflammatory cells throughout the bronchial tree both of fatal and of nonfatal cases of asthma, and demonstrated increased numbers of lymphocytes and eosinophils that were uniformly distributed throughout the large and small airways of mild and severe asthmatic persons as compared with control cases. Similar infiltration of T cells, macrophages and eosinophils into the proximal and distal lung tissues has also been reported in rare cases of sudden asthma death (dying within one hour of onset of symptoms)  and in soybean dust-induced asthma . Using resected lung specimens from asthmatic and nonasthmatic patients who underwent thoracic surgery, we evaluated the inflammatory process throughout the entire length of the airways . Our results have shown increased numbers of T cells (CD3+), total eosinophils (major basic protein positive) and activated eosinophils (EG2 positive) in both small (<2 mm internal diameter) and large (>2 mm internal diameter) airways from asthmatic patients when compared with those of control individuals (Figs 1 and 2). Comparing the large and small airways directly, a greater number of activated eosinophils (EG2 positive) was seen in airways with an internal diameter of less than 2 mm (Fig. 3), suggesting that a similar but more severe inflammatory process is present in the peripheral airways . 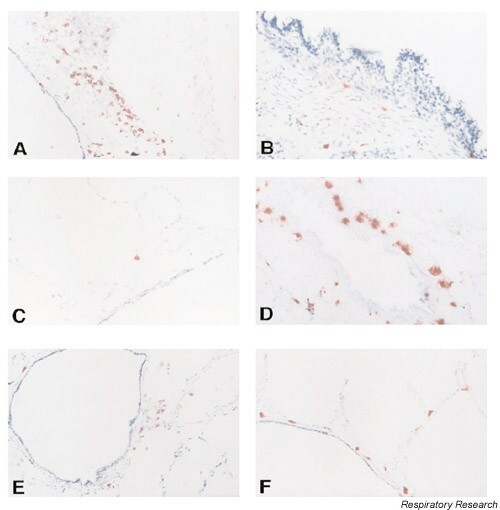 Immunocytochemical identification of (a) T cells (CD3) and (b) major basic protein-positive eosinophils in airways that are greater than 2 mm in diameter from patients with asthma. (c) Major basic protein immunostaining of an airway greater than 2 mm in diameter from a nonasthmatic person. (d) EG2-positive cells (activated eosinophils) in an airway less than 2 mm in diameter. (e) T-cell immunostaining in asthmatic airways that are less than 2 mm in diameter. (f) Eosinophil major basic protein immunostaining in lung parenchyma tissue from asthmatic patient. Adapted from Hamid et al. .
Immunocytochemical identification of T cells (CD3), total eosinophils (major basic protein; MBP), activated eosinophils (EG2) and mast cells (tryptase) in airways less than 2 mm in diameter (top) and in airways greater than 2 mm in diameter (bottom) from patients with asthma. Results given are average data from six (<2 mm) or 10 (>2 mm) airways from four to six asthmatic patients and 13 (<2 mm) or 31 (>2 mm) airways from six to 10 control individuals. *P < 0.05, ***P < 0.001 versus nonasthmatic, control individuals. Pi, internal perimeter. Adapted from Hamid et al. .
Immunocytochemical identification of T cells (CD3), total eosinophils (major basic protein; MBP), activated eosinophils (EG2) and mast cells (tryptase) in airways less than 2 mm (black) and greater than 2 mm (white) in diameter from patients with asthma. For airways that are less than 2 mm in diameter, results are expressed as the mean of six airways from four patients with asthma. For airways that are greater than 2 mm in diameter, results are expressed as the mean of 10 airways from six patients with asthma. *P < 0.05 versus airways >2 mm Pi. Pi, internal perimeter. Adapted from Hamid et al. . 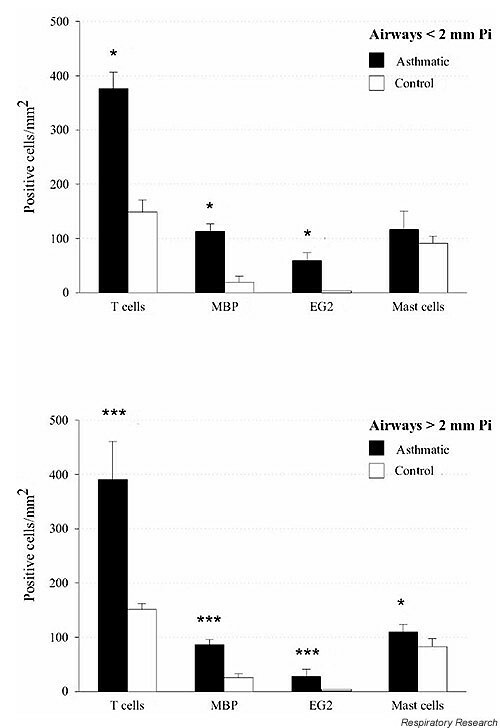 In the same cohort of patients, we also showed increased IL-5 and IL-4 mRNA-positive cells in the small airways of asthmatic persons as compared with nonasthmatic control individuals (Fig. 4) . More importantly, the expression of IL-5 mRNA was increased in the small airways compared with the large airways (Fig. 4) . Numbers of cells expressing IL-2 and IFN-γ mRNA were not elevated in those subjects when compared with the control individuals. In addition, using simultaneous in situ hybridization and immunocytochemistry, we were able to demonstrate that 85% of the IL-5 mRNA-positive cells in the small airways were T cells (CD3+), which is similar to the proportion found in the large airways (81%) . Recently, increased expression of eotaxin and monocyte chemotactic protein-4 mRNA has been reported in the epithelial cell layer (Fig. 5) and in the airway wall of small airways of asthmatic persons as compared with nonasthmatic control individuals . In that study, the number of chemokine-positive cells correlated with the number of major basic protein-positive eosinophils within the small airways . IL-4 and IL-5 mRNA expression in small (<2 mm in diameter) and large (<2 mm in diameter) airways of asthmatic patients and control individuals. For airways that are less than 2 mm in diameter, results are expressed as the mean of 10 airways from four asthmatic patients and 14 airways from 10 control individuals. For airways that are greater than 2 mm in diameter, results are expressed as the mean of 10 airways from six asthmatic patients and 10 airways from 10 control individuals. *P < 0.05 versus control. Pi, internal perimeter. 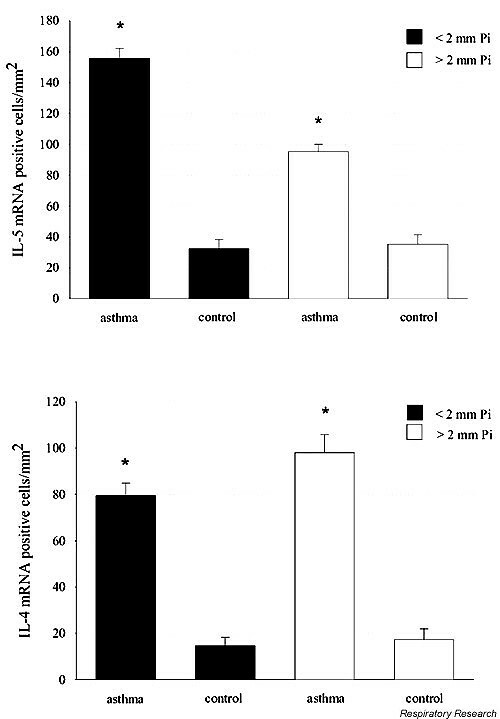 Adapted from Minshall et al. .
Eotaxin (top) and monocyte chemotactic protein (MCP)-4 (bottom) mRNA expression in the epithelium of small (<2 mm in diameter) and large (<2 mm in diameter) airways of asthmatic patients and control individuals. For airways that are less than 2 mm in diameter results are expressed as the mean of 10 airways from four asthmatic patients and 14 airways from 10 controls. For airways that are greater than 2 mm in diameter results are expressed as the mean of 10 airways from six asthmatic patients and 10 airways from 10 control individuals. *P < 0.05, **P < 0.01 versus control. Pi, internal perimeter. Adapted from Taha et al. . The use of lung sections allows examination of the smooth muscle cells. Haley et al. evaluated the distribution of CD45+ cells within the subepithelial regions of the airway wall. They showed that the small asthmatic airways had the majority of their inflammatory cells (CD45+ leukocytes and eosinophils) in the 'outer' airway wall region, whereas the greatest density of eosinophils in the large asthmatic airways was in the 'inner' airway wall regions (with 'outer' being defined as the area between the smooth muscle and the alveolar attachments, and 'inner' being defined as the area between the basement membrane and the smooth muscle). In addition, the small asthmatic airways showed a greater number of CD45+ cells and eosinophils in the 'outer' compared with the 'inner' airway wall region. These differences highlight the regional variations in inflammatory cell distribution within the asthmatic airway wall, and these differences appear to be disease specific because such variations are not observed in cystic fibrosis patients . The different regional organization of inflammatory cells throughout the tracheobronchial tree may be attributed to the differences in mechanisms of inflammatory cell recruitment and/or differences in chemokine and cytokine production between these regions. Haley et al. proposed that the smooth muscle layer of the small airways may be a site of chemokine production. In persons who die from asthma, inflammation extends well beyond the airway smooth muscle and is still significant around the pulmonary arterioles . Kraft et al. showed that significant alveolar inflammation is present in patients with nocturnal asthma (NA), which is not the case in those with non-nocturnal asthma (NNA), suggesting that alveolar tissue inflammation could also be important in the pathogenesis of asthma. In those studies both proximal airway endobronchial and distal alveolar tissue transbronchial biopsies were performed in each patient at 4.00 p.m. and at 4.00 a.m. Patients with NA demonstrated increased numbers of eosinophils per lung volume in lung parenchyma at 4.00 a.m. as compared with patients without NA, and the NA group had a greater number of eosinophils and macrophages in alveolar tissue at 4.00 a.m. than at 4.00 p.m. Moreover, in NA patients, only alveolar (and not central airway) eosinophilia correlated with overnight reduction in lung function . In their most recently reported data, those investigators showed increased numbers of CD4+ cells in the alveolar tissue of NA patients at 4.00 a.m. when compared with the NNA group [11,47]. Although the numbers of CD4+ cells in the endobronchial lamina propria were higher than in the alveolar tissue, only alveolar tissue CD4+ lymphocytes correlated with the predicted lung function (forced expiratory volume in one second) at 4.00 a.m. (r = -0.68) and with the number of activated alveolar eosinophils (EG2 positive; r = 0.66) . In this same cohort of patients, NA was associated with reduced glucocorticoid receptor (GR)-binding affinity (indicated by an increased Kd), reduced proliferation of peripheral blood mononuclear cells and decreased responsiveness to steroids at 4.00 a.m. compared with NNA patients . These studies demonstrate that the increased numbers of CD4+ cells in alveolar tissue in NA patients, as well as the reduced GR-binding affinity and reduced steroid responsiveness, may be responsible for orchestrating eosinophil influx and exacerbations of symptoms in these patients [11,48]. One of the mechanisms that may be responsible for this phenomenon is an upregulation of GR-β, which has previously been reported in steroid-insensitive persons with severe asthma . Christodoulopoulos et al. 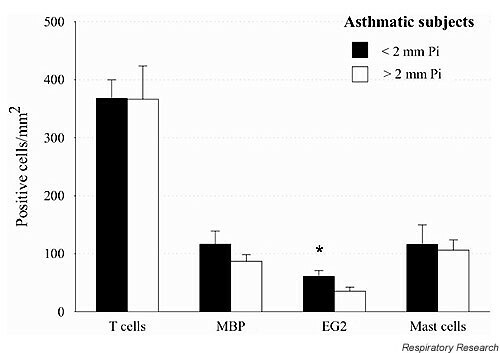 have characterized the expression of GR-β within peripheral airways in fatal asthma. They showed that the main cells that expressed GR-β were CD3+ T lymphocytes and, to a lesser extent, eosinophils, neutrophils and macrophages . Those results suggest that the increased number of GR-β-positive cells in the small airways in fatal asthma may be associated with steroid insensitivity, contributing to asthma mortality. Similar small airway inflammation has been reported in severe symptomatic, steroid-dependent asthmatic persons. Using endobronchial and transbronchial biopsies, Wenzel et al. reported persistent proximal and distal airway inflammation. Although the number of eosinophils was similar between severe asthmatic persons and normal control individuals, patients with severe asthma had high numbers and percentages of neutrophils in bronchoalveolar lavage, and endobronchial and transbronchial biopsy specimens when compared with mild-to-moderate asthmatic persons, despite aggressive treatment with steroids. It has been speculated that the inflammatory cell density in peripheral airways in severe asthma may relate to the peripheral airway obstruction that is characteristic of this disease. The small airway inflammation may cause an uncoupling of the parenchyma and airways due to the mechanical interdependence between these two compartments, leading to changes in overall lung mechanics in asthmatic persons. Those results have therapeutic as well as diagnostic implications. On the basis of the physiological and pathological evidence presented in the present review, small or peripheral airways and lung parenchyma are clearly implicated in the pathogenesis of asthma. Because this is the 'quiet' zone, however, damage in the small airways often goes undetected. What is unclear at present is whether inhaled corticosteroids (the mainstay of asthma treatment) effectively treat this compartment of the lung. Although inhaled corticosteroids reduce airway inflammation in patients with mild-to-moderate asthma [50,51], prolonged courses of inhaled steroids do not normalize hyper-responsiveness . Furthermore, it was demonstrated in deposition studies that most of the currently used inhaled corticosteroids are predominantly deposited in the central airways and not in the lung periphery . Metered-dose inhalers (MDIs), pressurized inhalers, or dry powder inhalers are not very efficient at depositing medication in the more peripheral airways of the lung. These delivery systems typically deliver no more than 15% of the inhaled dose to the lungs . The challenge for the pharmaceutical companies is to improve the technology of aerosol delivery systems. This will ultimately allow delivery of anti-inflammatory drugs to the peripheral and to the central inflammatory sites with minimal oropharyngeal deposition. Such technologies will thus enable us to treat inflammation uniformly throughout the airways. Better lung deposition of the steroids may be achieved by modification of propellants to produce finer and slower moving aerosols. The latest development is the introduction of chlorofluorocarbon-free hydrofluoroalkane propellants, which exhibit improved airway targeting when compared with beclomethasone in chlorofluorocarbon propellant [55,56,57]. Equivalent control of the disease and improvement in lung function have been reported, and studies have shown that this new formulation delivers extra-fine particles (only 1.1 μm in diameter) [56,58]. Leach et al. have directly compared the steroid airway targeting achieved using the novel hydrofluoroalkane MDI with that achieved with the conventional chlorofluorocarbon MDI. By radiolabelling beclomethasone dipropionate (BDP), they demonstrated that hydrofluoroalkane propellant deposits 55–60% of BDP into the lungs and 29–30% into the oropharynx. Using the chlorofluorocarbon propellant, however, only 4–7% of BDP was deposited in the lungs and the remainder into the oropharynx. With hydrofluoroalkane-BDP, those investigators were able to demonstrate equivalent control of the disease at half the daily dose required for chlorofluorocarbon-BDP. In addition, Marshall et al. have demonstrated that alveolar deposition with inhaled hydrofluoroalkane-BDP is able to inhibit lipopolysaccharide-induced production of tumour necrosis factor-α by human alveolar macrophages cultured ex vivo, suggesting that steroid distribution to the alveoli might be beneficial for the treatment of asthma. These radiolabelled drug deposition studies must be interpreted with caution, however, because the labelling process itself may alter the distribution properties of the inhaled steroid particles. There is accumulating evidence to suggest that airway inflammation occurs in all parts of the airway. Although the clinical significance of small airways in asthma is not yet known, it is possible that poorly controlled inflammation in peripheral airways, which are not penetrated by conventional inhaled steroids, may contribute to accelerated decline in lung function and airway remodelling — the hallmarks of asthma. The introduction of high-resolution computed tomography allows assessment of the morphological changes (resulting from air trapping and regional hyperinflation) in the small airways that are associated with dysfunction too subtle to be identified with lung function testing alone . This novel, noninvasive imaging technique may prove to be important not only in the diagnosis of small airway inflammation, but also in helping us move toward a better understanding of the role of the small airways in the pathogenesis of allergic asthma. The authors acknowledge the support of 3M Pharmaceuticals and MRC Canada for their support. MKT is a Ludwig-Engel Post-Doctoral Fellow.